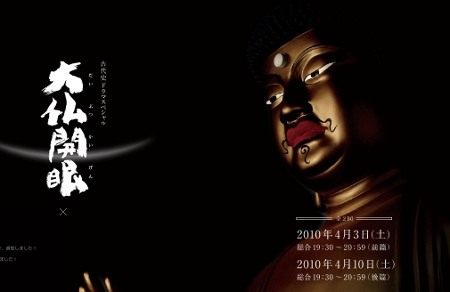 To commemorate the 1300th anniversary of the establishment of the Nara Heijo-kyo, the ancient capital of Japan, NHK's two-part drama special "Consecration of the Great Buddha" depicts the human relationships behind the completion of the Great Buddha (known in Japan as simply Daibutsu)). The statue was constructed by the Emperor Shomu in Heijo-kyo in the 8th Century. Most notable to the completion of the Great Buddha was Kibi no Makibi (Hidetaka Yoshioka), a Japanese scholar, who led the project to construct the Great Buddha.